This month’s blog challenge is to write a post on a topic starting with the first letter of my name – M. So what better to talk about than Money? I know the year is almost over, and this post should probably have been written back in September before everybody spent all their money, but maybe some of these tips can be useful for next year. One of the greatest challenges we face as students is learning how to manage our money. Once the student loan gets in it’s tempting to run off to the nearest shop and spend it all, but rent and bills need to be paid and there still has to be money left over to live until the next batch comes in. So here are some tips that I’ve found useful trying to make ends meet as a student and being able to save some money along the way. Some people think budgets are overrated, but I myself find them quite useful. 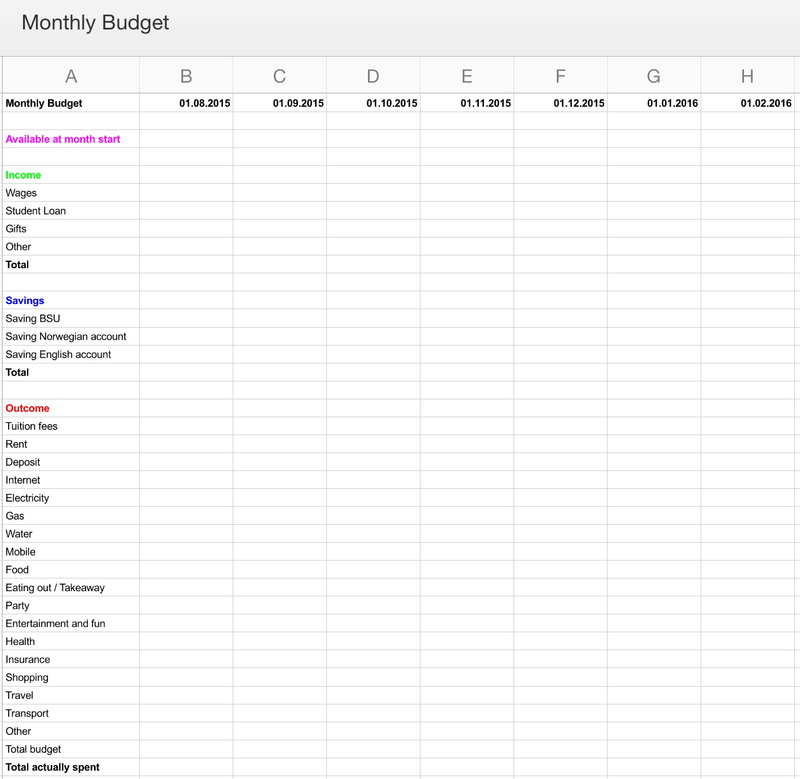 A budget can be monthly or weekly, and it’s a nice and structured way of keeping track of your expences. The budget doesn’t have to be accurate at first. If you are doing a monthly budget you can plot in how much your rent and your bills are every month because you may already know how much you have to pay. For expenses such as food and shopping you can write down how much you think or plan to use. If you keep your recepits until the end of each month you can calculate how much you actually spent and see if you stuck to your budget or not. Weekly budgets can be useful, too, because you can add in exactly what week you need to pay your bills. There are countless budget apps for both iPhone and Android which you can download and keep handy on your phone. Personally I like sticking to spread sheets and use Excel for budgets. 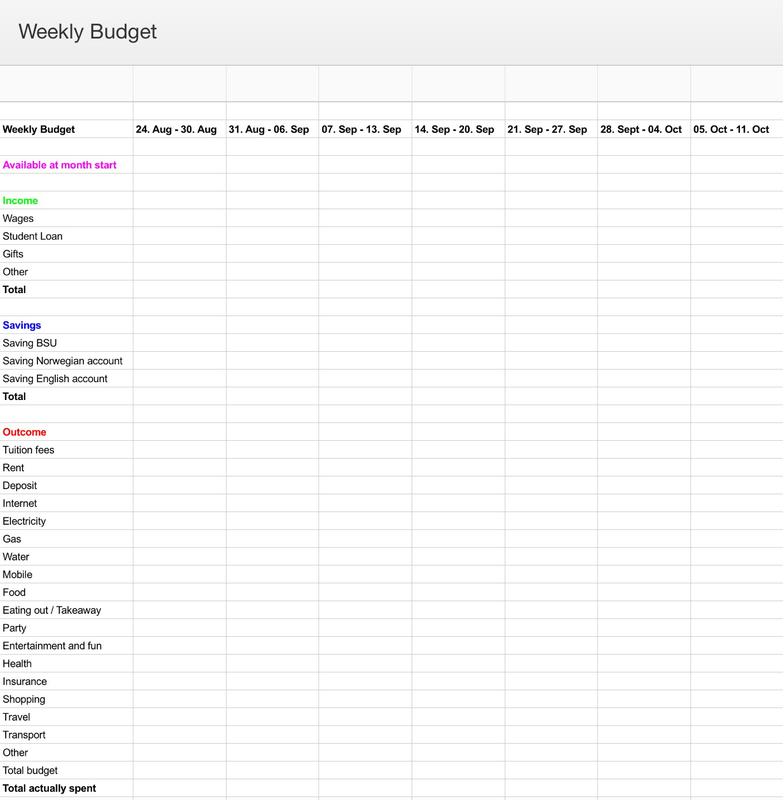 Here are two examples of a weekly and a monthly budget plan that I’ve made for my own use. You’re welcome to copy them if you like. Student or not, food is always going to be something you need to spend money on. I’ve found that planning my meals every week has helped me save money in the long run. I’ll sit down once a week and plan what to have for dinner a week ahead and write a shopping list of what I need to buy. Then I do one weekly shopping and try to pick the cheaper options where I can, and shop on sale where I can. I use MealPlan for iPad to keep my meal plan. I’ve tried different apps before but found this one to be good because you can save recepies you use often and it will create a shopping list for you. Quite handy! Another tip is to bring packed lunches and avoid buying that coffee from Costa every morning. Spending £4 on lunch five days a week easily adds up… Imagine how much money you can save on bringing packed lunches. There is a lot of money to save on basically everything if you know where to look. Get a railcard if you travel often by train. Get a NUS card to save money on clothes, food and so many other things. Even though you have to pay for these cards it will save you money in the long run. And only but Domino’s on 2-4-1 days. Go out on student nights. Subscribe to your favourite shop’s e-mails and great sale codes might just pop into your inbox when you need them to. There are always deals somewhere! And put a certain amount off every month. It doesn’t have to be a lot. Even saving £5 a month will get you £60 at the end of the year. That’s £60 you can to spend on whatever you like or keep on saving. One of my friends told me that when she want to save money she picks two things we want to do that week and make herself choose one. So for example: do I want to order pizza tonight, or do I want to go out on Friday? Say you choose to go out on Friday. Then you would take the money you normally would have spent on the pizza and put those in the savings account. Do this once a week and suddenly a little sum of money will start to build up. Have stuff you don’t need anymore but might be useful for someone else? Sell it! If you can get money from it, it’s worth a shot. Try selling it to a friend or advertise it on Facebook or a sales website. Do you really need to buy books new? Maybe there is money to save in buying them used. E-books are also cheap these days so check out the Amazon Kindle app, you can download it to any laptop, tablet or phone to buy and read e-books. Transportation cards and taxis are expensive, so try to walk or ride a bike as much as you can. Not only do you save money, you get fit too! Portsmouth students are also lucky enough to have a free uni bus so, which is great if you live far away and close to a stop. You did actually pay to go to university, so it might be a bit of a waste not showing up to lectures. It can also save you money if you pass the exam, you don’t have to come back in the summer for resits, or repeat your year. This might be a given, but a ticket home for a week might be cheaper than a week’s worth of food. Maybe some time with mum and dad can help you same some money. And possibly earn some if you pay a visit to grandma while at it. If you do need that extra bit of money, you can always get a job a few hours a week. Hopefully these tips have been a bit useful, good luck!